Upgrade your Podium piggyback shock to our QS3 tool-free adjuster allows for simple and repeatable suspension setting changes on the fly. Its wide range of compression adjustment provides noticeable changes of ride quality and handling without the complications of counting detents. Choose a QS3 setting that gives you the most confidence, comfort, or handling characteristics with just a "flip of a switch." Available for most piggyback 1.5 Zero & Evol OEM shocks. Price is for a pair of shocks, and does not include labor. Buttery-smooth, genuine Kashima Coat is available from FOX. Its distinctive gold color is backed by its high performance attributes — properties that provide an exceptionally smooth feel and extreme durability. Brand new for FLOAT X EVOLs and developed by the Miyaki Company of Japan, Kashima Coat offers superior durability, hardness, and less friction. 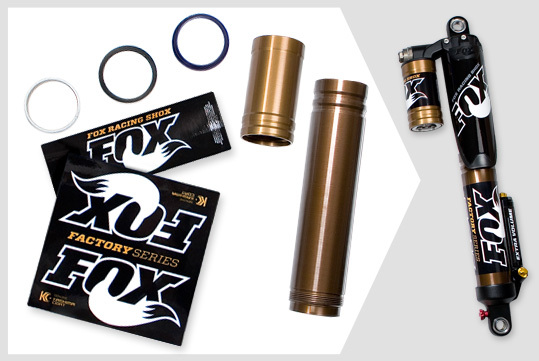 Athletes who raced with Kashima Coat-treated FOX suspension in 2011 reported better overall traction and small bump compliance, and significant decrease in friction has proven to give riders a tangible increase in suspension performance. For a complete set of FLOAT X EVOL front shocks. Includes Kashima-coated air sleeves and reservoirs and a complete air sleeve and reservoir rebuild with new bushings and seals. Everything you need is included in this kit to transform your FLOAT, FLOAT 2, or FLOAT 3 into a FLOAT EVOL. With our EVOL Upgrade Kit, you gain additional adjustment features and an extra-plush, bottomless ride feel without altering the ride height or roll stiffness of your sled. Available for select front ski, and rear track applications. Price does not include labor or any additional parts or upgrades.